Background: Endodontic-periodontal pathogens exist as biofilms which are difficult to eliminate. Biosynthesized silver nanoparticles (AgNPs) emerged as newer antimicrobial agents with potential benefits. Aim: The aim of this study is to determine the minimum inhibitory concentration (MIC); evaluate the antibiofilm efficacy of fungal-derived AgNPs against Porphyromonas gingivalis, Bacillus pumilus, and Enterococcus faecalis. Materials and Methods: MIC of AgNPs against test pathogens was determined using micro broth dilution method. Serial dilutions of AgNPs ranging from 80 to 1 μg/ml concentration were added to wells containing 10 μl of bacterial inoculum in culture media and control group without AgNPs. For biofilm models, 120 dentin blocks were prepared, sterilized, and contaminated for 2 weeks with (n = 40 each). Group 1: B. pumilus, Group 2: E. faecalis, and Group 3: P. gingivalis and each group is divided into four subgroups (n = 10 each) and treated with distilled water, AgNPs, 2% and 0.2% chlorhexidine (CHX). Colonies counted after 24 h of incubation and statistically analyzed using one-way ANOVA and post hoc Tukey tests. Results: MIC for B. pumilus was determined as 20 μg/ml and 30 μg/ml for E. faecalis and P. gingivalis. 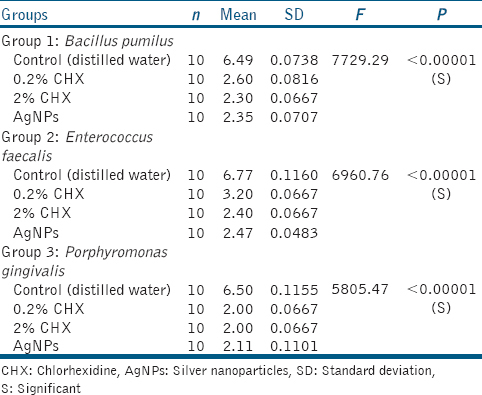 AgNPs were effective as 2% CHX against all biofilms compared to control group. Post hoc Tukey test (P < 0.0001) shows no significant difference between groups. Conclusion: Fungal-derived AgNPs are effective against endo-perio pathogens. Most of the periodontal and endodontic infections are biofilm mediated and have been the subject of intensive research for many years. Bacteria in biofilm exhibit resistance to host defense mechanisms and decreased susceptibility to conventional antimicrobials. Recently, biosynthesized silver nanoparticles (AgNPs) have emerged as novel antimicrobial agents owing to their unique chemical and physical properties, smaller size and shape, high surface area to volume ratio, and no bacterial resistance. Hence, show an insight for the management of endodontic, periodontal, or the combined lesions. In our previous study, AgNPs were biosynthesized using endophytic fungi fusarium semitectum and showed efficient antibacterial activity against P. gingivalis, B. pumilus, and E. faecalis The present study aims at evaluating the minimum inhibitory concentration (MIC) of biosynthesized AgNPs and antibacterial efficacy against endo-periopathogens P. gingivalis, B. pumilus, and E. faecalis in biofilm form using dentin blocks. AgNPs were biosynthesized using endophytic fungi Fusarium semitectum and characterized by ultraviolet spectrum, transmission electron microscopy and Fourier transform infrared spectroscopy as described earlier were used in the present study., Briefly, the fungi isolated from healthy leaves of Withania Somnifera (Ashwagandha) were allowed to grow on potato dextrose agar plates. Fresh fungal cultures were inoculated in 100 ml malt glucose yeast peptone broth and incubated at 29°C for 72 h. The fungal biomass was filtered using Whatman filter paper number 1, washed with sterile distilled water and 25 g of fungal biomass was then added to flasks containing 100 ml of sterile distilled water and incubated for 48 h. The cell-free fungal filtrate was mixed with 100 ml of 1 mM concentration AgNO3 solution and kept in the dark at 29°C for 24 h and pH adjusted to 7 was used further. The American type culture collection strains ([ATCC], Manassas, VA, USA) of B. pumilus (27142) and E. faecalis (29212) strains were sub-cultured on trypticase soy agar (TSA) plates and incubated at 35°C for 24 h. P. gingivalis (33277) strains were subcultured on sterilized TSA supplemented with 5% sheep blood, hemin (5 μg/ml), vitamin K1 (0.5 μg/ml), and yeast extract (10 mg/ml) and incubated at 37°C for 72 h under anaerobic conditions. MIC of AgNPs against test organisms was determined by micro broth dilution technique as per Clinical and Laboratory Standards guidelines. Each bacterial inoculum was adjusted to 1–2 × 105 cells/ml and 10 μl bacterial inoculum of each test organism was added to wells of microtiter plates with respective culture medium containing 100 μl of series of dilutions of AgNPs ranging from 80 μg/ml to 1 μg/ml. Culture media without AgNPs was used as control group and 10 μl Alamar blue (0.7 mg/ml) was added to all the wells. The treated test plates were incubated at 37°C for 24 h and optical density at 600 OD was measured in plate reader (BioTek, PowerWave XS2, Vermont, USA). The lowest concentration of AgNPs that inhibits the growth of test organisms in comparison to the control group was defined as the MIC value. 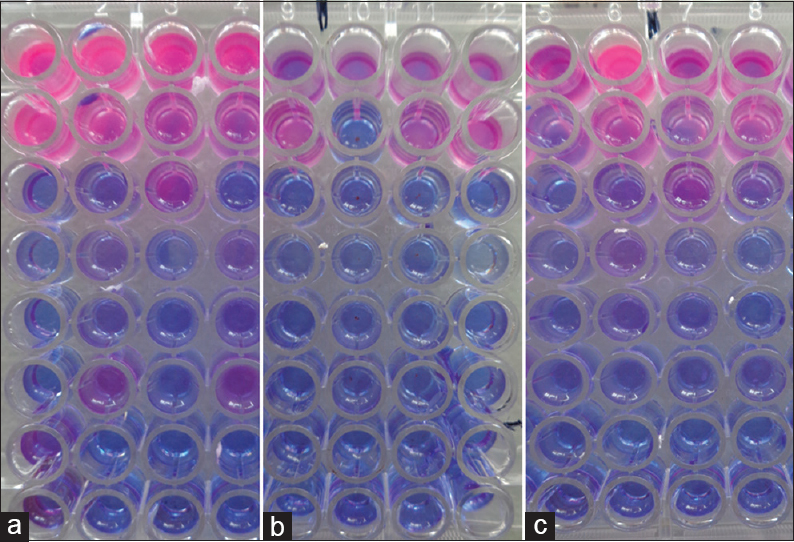 The experiments were performed in triplicates [Figure 1]a,[Figure 1]b,[Figure 1]c.
The antibacterial efficacy of biosynthesized AgNPs against test microorganisms in biofilm form was evaluated using the dentin blocks according to Nascimento et al. with slight modifications. The study was approved by the Institutional Ethical Committee. Overnight grown cultures of test organisms were centrifuged at 6000 rpm for 10 min at 4°C. The supernatants were discarded, and the cells were washed twice in sterile deionized water and suspended in 5 ml of TSA broth for B. pumilus and E. faecalis and in TSA supplemented broth for P. gingivalis and incubated for 4 h at 37°C. Turbidity was adjusted to 1 × 107 cells/ml using a spectrophotometer. One hundred and twenty dentin blocks were prepared using sixty human extracted single-rooted teeth. The crown and the apical part of the root were sectioned using a rotary diamond disc to obtain the middle third of the root which was vertically sectioned into two halves, and cementum was removed using the diamond bur to obtain the dentin blocks measuring 5 mm × 5 mm × 1 mm (width × length × thickness). The dentin blocks were treated in an ultrasonic bath of 17% EDTA (Prime Dental Products, Mumbai, India) for 5 min to remove the smear layer followed by 3% sodium hypochlorite (Prime Dental Products, Mumbai, India) for 5 min to remove the organic and inorganic debris and distilled water for another 5 min to remove all the chemicals used and sterilized by autoclaving. The dentin blocks were randomly divided into three groups (n = 40 each) as group 1: B. pumilus (ATCC 27142), Group 2: E. faecalis (ATCC 29212), and Group 3: P. gingivalis (ATCC 33277). For Groups 1 and 2, each dentin block was placed in individual test tubes containing 1 ml of TSA broth and for Group 3 the dentin blocks were placed in individual test tubes containing TSA supplemented broth and subjected to the second cycle of sterilization. Subgroup 1 D: 20 μg/ml of AgNPs (MIC dose). Subgroup 2D: 30 μg/ml of AgNPs (MIC dose). Subgroup 3D: 30 μg/ml of AgNPs (MIC dose). After 24 h incubation, each dentin block was rinsed in saline and transferred to micro centrifuge tubes and shaken for 60 s (vortex AP 56). Serial decimal dilutions were prepared, and 50 μl of the dilution were placed on TSA plates for Groups 1 and 2 specimens and on TSA supplemented plates for Group 3 specimens and incubated for 24 h followed by colony forming units (cfu/ml) counting. Data collected was statistically analyzed using One-way ANOVA and Post Hoc Tukey multiple comparison tests [Figure 2]. All the test microorganisms were sensitive to biosynthesized AgNPs. The mean value of the three readings was calculated as MIC. MIC of AgNPs for B. pumilus was determined as 20 μg/ml and for E. faecalis and P. gingivalis 30 μg/ml respectively. For antibacterial efficacy in biofilm mode, the mean colony count (cfu/ml ) for all the groups was evaluated and shown in [Table 1] and [Table 2]. The results of the present study indicate biosynthesized AgNPs are effective against all the three test microbes when compared to the control group. There is no statistically significant difference between the three groups when compared between groups by Post hoc Tukey multiple comparison test. Microorganisms grown in biofilms are difficult to eradicate with existing antimicrobial agents and exhibit resistance. Since endodontic-periodontal infections are biofilm mediated and resistant to existing antimicrobial agents, the present study aims to evaluate the antibacterial efficacy of biosynthesized AgNPs against the biofilms of B. pumilus, E. faecalis and P. gingivalis. MIC is the lowest concentration of a drug that inhibits the visible growth of the test organism, used to determine the in vitro antibacterial activity of new antimicrobial agents. Different bacterial species have varying MICs. In vitro detection of MIC acts as a guideline for clinical application Although antimicrobial activity of biosynthesized AgNPs was proven on many pathogenic bacteria;,, Literature is scarce for application of biosynthesized AgNPs for determining MIC and antibacterial efficacy of fungal-derived AgNPs using tooth models against P. gingivalis, B. pumilus, and E. faecalis. The results of the present study show that AgNPs are effective against test microorganisms with MIC values of 30 μg/ml against P. gingivalis and E. faecalis and 20 μg/ml against B. pumilus. MIC values of AgNPs synthesized using Chamaemelum nobile extract against Escherichia More Details coli, Staphylococcus aureus and Bacillus subtilis was found to be 7.8, 31.2, and 15.6 μg/ml. MIC of AgNPs-derived from Garcinia imberti against E. faecalis was observed maximum at a concentration of 62.5 mg/ml MIC of fungal-derived AgNPs against E. faecalis biofilm was determined 30 μg/ml with effective antibacterial efficacy. The results of the present study showed effective antibacterial activity against all the test microbes. In the present study, the MIC dose of AgNPs was standardized to evaluate the antibacterial efficacy against test pathogens in biofilm form because it is the minimum dose which inhibits the visible bacterial growth therefore used to evaluate the efficacy of AgNPs at a minimal dose. Chlorhexidine (CHX) is the most effective antimicrobial agent; its effectiveness can be attributed to its substantivity within the oral cavity. It is recommended to use 0.2%–0.12% CHX for plaque control and 2% CHX is recommended as root canal irrigant;, hence, both 0.2 and 2% CHX were used in the present study. Antimicrobial studies on planktonic culture models do not correlate well with clinical findings. Therefore; to ascertain the antibacterial efficacy of AgNPs effectively biofilm model using dentin blocks was evaluated. Human permanent teeth were used to prepare the dentin blocks as they simulate clinical conditions. E. faecalis biofilm was more resistant to CHX than the same strain grown in planktonic suspension and 2% CHX eliminated most of the E. faecalis biofilms., AgNPs against E. faecalis biofilm using dentin blocks showed less number of viable bacteria for AgNPs compared to CHX. The results of the present study show effective antibacterial activity of biosynthesized against B. pumilus, E. faecalis and P. gingivalis biofilm model at a dose ranging from 20 to 30 μg/ml indicating they can be used as antimicrobial agents in periodontal, endodontic and combined lesions. Results of the present study show an insight for application of biosynthesized AgNPs for the treatment of endo-perio lesions; can be used as root canal irrigants, intracanal medicaments, root canal sealers, can be incorporated for periodontal therapy alternative to topical antiseptics, antimicrobial agents and for local drug delivery. The present in vitro study helps to design and develop intervention approaches for controlling periodontal, endodontic or combined lesions incorporating biosynthesized silver nanoparticles. However, in vitro values of MIC may not hold for in vivo conditions as the bacterial growth varies from in vitro and in vivo conditions. In vitro determination of MIC serves as an attempt for quantifying drug activity against the test microorganisms, and the results of the study show biosynthesized AgNPs are effective against biofilms of P. gingivalis, B. pumilus and E. faecalis. Davies D. Understanding biofilm resistance to antibacterial agents. Nat Rev Drug Discov 2003;2:114-22. Ozbek SM, Ozbek A. Real-time polymerase chain reaction of “red complex” (Porphyromonas gingivalis, Tannerella forsythia, and Treponema denticola) in periradicular abscesses. Oral Surg Oral Med Oral Pathol Oral Radiol Endod 2010;110:670-4. Halkai R, Hegde MN, Halkai K. Evaluation of the presence of Enterococcus faecalis in root cementum: A confocal laser scanning microscope analysis. J Conserv Dent 2014;17:119-23. Johnson BT, Shaw LN, Nelson DC, Mayo JA. Extracellular proteolytic activities expressed by Bacillus pumilus isolated from endodontic and periodontal lesions. J Med Microbiol 2008;57:643-51. Duggan JM, Sedgley CM. Biofilm formation of oral and endodontic Enterococcus faecalis. J Endod 2007;33:815-8. How KY, Song KP, Chan KG. Porphyromonas gingivalis: An overview of periodontopathic pathogen below the gum line. Front Microbiol 2016;7:53. Halkai KR, Mudda JA, Shivanna V, Rathod V, Halkai R. Biosynthesized silver nanoparticles from fungi as antimicrobial agents for endo-perio lesions – A review. Ann Res Rev Biol 2016;10:1-7. Halkai KR, Mudda JA, Shivanna V, Rathod V, Halkai RS. Evaluation of antibacterial efficacy of biosynthesized silver nanoparticles derived from fungi against endo-perio pathogens Porphyromonas gingivalis, bacillus pumilus, and Enterococcus faecalis. J Conserv Dent 2017;20:398-404. Halkai KR, Mudda JA, Shivanna V, Rathod V, Halkai RS. Biosynthesis, characterization and antibacterial efficacy of silver nanoparticles derived from endophytic fungi against P. gingivalis. J Clin Diagn Res 2017;11:ZC92-96. Clinical and Laboratory Standards Institute. Methods for Dilution Antimicrobial Susceptibility Tests for Bacteria That Grow Aerobically. 9th ed. Wayne, PA, USA: Clinical and Laboratory Standards Institute Document M07-A9, Clinical and Laboratory Standards Institute; 2012. Nascimento CA, Tanomaru-Filho M, Faria-Junior NB, Faria G, Guerreiro-Tanomaru JM. Antimicrobial activity of root canal irrigants associated with cetrimide against biofilm and planktonic Enterococcus faecalis. J Contemp Dent Pract 2014;15:603-7. Kishen A. Advanced therapeutic options for endodontic biofilms. Endod Topics 2012;22:99-123. Halkai KR, Mudda JA, Shivanna V, Rathod V, Halkai R. Evaluation of antibacterial efficacy of fungal-derived silver nanoparticles against Enterococcus faecalis. Contemp Clin Dent 2018;9:45-8. 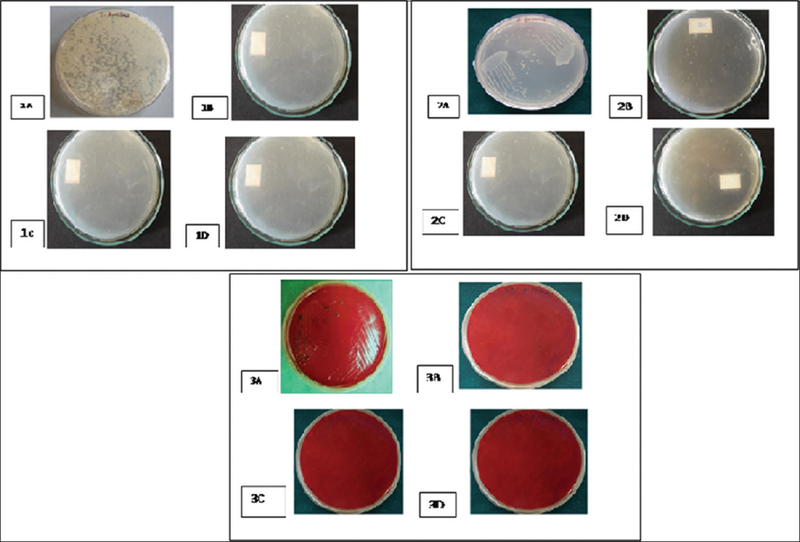 Halkai KR, Mudda JA, Shivanna V, Rathod V, Halkai R. Antibacterial efficacy of biosynthesized silver nanoparticles against Enterococcus faecalis biofilm: An in vitro study. Contemp Clin Dent 2018;9:237-41. 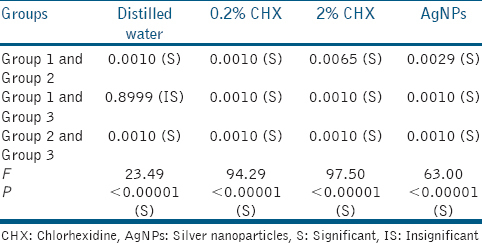 Erjaee H, Rajaian H, Nazifi S. Synthesis and characterization of novel silver nanoparticles using Chamaemelum nobile extract for antibacterial application. Adv Nat Sci Nanosci Nanotechnol 2017;8:1-9. Levison ME. Pharmacodynamics of antimicrobial drugs. Infect Dis Clin North Am 2004;18:451-65, vii. Ninganagouda S, Rathod V, Jyoti H, Singh D, Kulkarni P, Haq MU. Extracellular biosynthesis of silver nanoparticles using Aspergillus flavus and their antimicrobial activity against gram negative MDR strains. Int J Pharma Bio Sci 2013;4:222-9. Deshpande N, Amrutiya Mansi R. Comparative evaluation of anti-microbial efficacy of green tea extract and chlorhexidine mouthwash on red complex, orange complex and green complex periodontal pathogens – An in vitro study. Int J Innov Dent Sci 2017;2:1-12. Wu D, Fan W, Kishen A, Gutmann JL, Fan B. Evaluation of the antibacterial efficacy of silver nanoparticles against Enterococcus faecalis biofilm. J Endod 2014;40:285-90. Abdullah M, Ng YL, Gulabivala K, Moles DR, Spratt DA. Susceptibilties of two Enterococcus faecalis phenotypes to root canal medications. J Endod 2005;31:30-6. Lima KC, Fava LR, Siqueira JF Jr. Susceptibilities of Enterococcus faecalis biofilms to some antimicrobial medications. J Endod 2001;27:616-9.